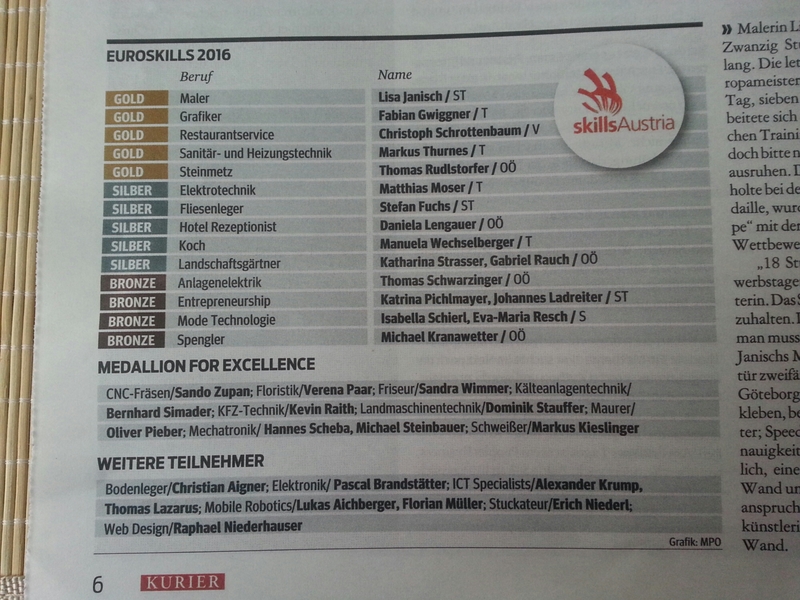 The EuroSkills championship has just taken place in Göteborg, Sweden, and once again Austria has done extremely well for such a small country (see below). At the top of the list is Lisa Janisch, painter. She had the highest points of all competitors and with that got a gold medal and was “Best of Nation” and “Best of Europe”. The tasks she had to complete: painting an inside door in two colors, putting up wallpaper, painting Göteborg’s opera house on a wall (with some technical details I can’t translate because I don’t understand them), speed painting, and finally using a technique of her choice to decorate a 2 m2 wall area. (She chose to paint her shadow on the wall using a sophisticated stucco technique.) She said the hardest part was completing these tasks well in the time allowed and that she was helped by the fact that she had been practicing all day, every day for months until her boss told her to go home and get some sleep. I continue to love the fact that there are competitions for work performance. On our walk this morning, Maylo and I went past a construction site. One of the men took one look at Maylo in his little coat (it’s still below freezing here) and said, with a smile, to me, “You forgot something. Where are his gloves?” From his accent and his good humor at that hour of the morning I think he was one of the thousands of Poles who help keep this city running. And the former president of Austria, Heinz Fischer, recently was at a gala concert in the Musikverein to celebrate pianist Rudolf Buchbinder’s 70th birthday. One thing I have always appreciated about Fischer is that he likes classical music and can often be seen at concerts, usually without any obvious security. The first time I saw him, I was dissecting a concert with some Austrian friends and interrupted to point and say, “Der Bundespräsident!” They glanced over and said, more or less, “Of course. What did you expect? He often comes to concerts” and turned back to continue our conversation. What did I expect??? A security detail taking the president out through a back passage, not this short, middle-aged man walking out alone looking contemplative. Austria has elected Alexander van der Bellen as its new president. Van der Bellen was formerly head of the Green Party and ran as an independent. He won against Norbert Hofer, the candidate of the right-wing, nationalist party. Thank you, Austria! It’s that time of year again. The Kurier has printed a recipe for Vanillekipferln (an essential and quintessential Viennese Advent and Christmas cookie) with the comment that there are probably as many recipes as there are “Omas” (grandmothers). Here is their version this year. one packet of vanilla sugar. (1) Mix the flour, almonds, sugar, and a pinch of salt. Cut the cold butter into pieces and knead it quickly into the flour mixture. Wrap the dough in foil and cool for at least 30 minutes. (2) Cover a cookie sheet with parchment paper, turn the oven on to 180 degrees C. Knead the dough one more time. Cut about 1/3 off and put the rest back into a cool place. (3) Shape the dough into a roll with a diameter of about 5 cm. Cut the roll into slices of about 1 cm each. Out of each slice roll the dough between the palms of your hands until it is 6 – 8 cm long. Bend the dough into a crescent shape and place on the cookie sheet. Bake the batch for about 15 minutes. (4) Remove the cookie sheet from the oven, take off the cookies, and let them cool for a few minutes. Mix the powdered sugar with the vanilla sugar and turn the warm Kipferln carefully in the sugar mixture. Put the finished cookies on a plate to cool and then store for a few days in a tin before eating. After four months in the U.S. Maylo and I are back in Vienna. Anyone who’s been following this blog at all knows how much I love this city, but what did I notice most in the last 48 hours? Sadly, how much and how indiscriminately people smoke. Ah, well. Nothing is perfect.